The Balle au Bond is a boat moored on the River Seine in Paris that provides a lovely setting for a meal within the cafe lounge area, a brunch buffet, a relaxing drink or enjoying one of the many different forms of entertainment they have on offer such as concerts and performing artists like magicians. Whether you are looking for an unusual place to enjoy a drink or lunch, have a Sunday brunch, just enjoy a glass of wine, or enjoy one of the cultural events that are organised, La Balle au Bond is an ideal solution. 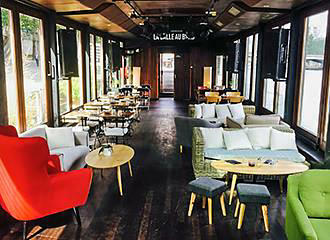 Situated on a Peniche, which is a traditional barge, the Balle au Bond is open from midday through to 6pm for drinks and lunches, however, one of their main aims is to provide a varied programme of entertainment that is suitable for all tastes with different concerts from Jazz through to Rock, Classical, Chanson and more. Yet they also hold literary events including poetry evenings or song and Chanson, not forgetting the performing arts including magicians, mimes, clowns and more, so there is always something different to discover on board this renovated boat moored along the River Seine in Paris. 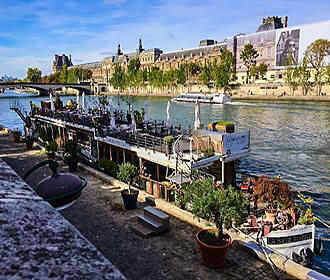 And whether you wish to attend one of their evening concerts or enjoy a quiet lunch, you can enjoy the scenery including the many boats going by on sightseeing tours of the River Seine. But on a Saturday and Sunday between 11am and 3pm they offer a buffet brunch with everything from pancakes through to pastries and much more to tempt your taste buds. You will find the Peniche La Belle au Bond moored on the left bank of the River Seine by the Quai Malaquais in the 6th Arrondissement close to the Pont des Arts Bridge of Love, which is now famous for people attaching padlocks, or lovelocks to the railings. 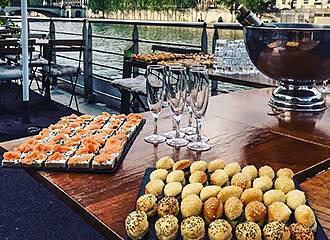 As you can imagine, being situated on a boat, spaces are limited and therefore booking is highly recommended, and they do request you book for the brunch, plus although the cultural events and concerts vary in price, it is advisable that you book these as well. But getting to this unusual cafe - lounge restaurant and entertainment venue is easy, as you could utilise the Metro via the Louvre - Rivoli stop, the Pont Neuf stop or the Saint-Michel stop, and this one also covers the RER trains as well. However, the bus numbers 21, 24, 39, 69, 72, 76, 85 and 95 will also get you close by, as will the Batobus water bus service via the Saint-Germain-des-Pres docking station, which is only approximately 20 metres away. Yet if you are utilising the Velib bike rental system there is a cycle station right at the Quai Malaquais, but if you your own transport, then there are also three different secure 24 hour car parks close by including one on the Rue Mazarine.